Today’s women are under great demands, having to juggle work, family and faith. It’s easy to get overwhelmed and frustrated, losing sight of the bigger picture. A women’s retreat is a great way to take a step back, re-energize, and prepare to wade back into the fray of daily life. 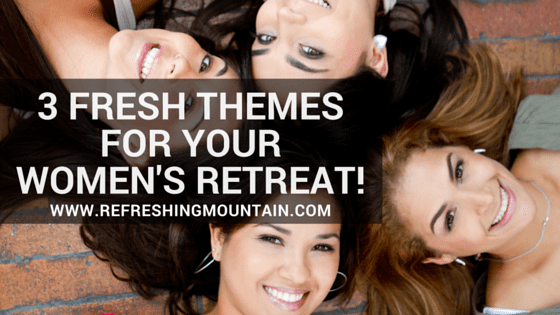 With one of these fun themes, your women’s retreat is sure to be a hit. Every woman enjoys a good handbag. From band-aids to cell phones, to candy and safety pins, a woman’s purse is often a treasure trove of items fit to solve the many problems that arise daily. Women often see themselves as helpers, problem-solvers, and as a servant to others. With a Purses and Prayer theme, you can remind women to take time out of each day for prayer or mindfulness. Each time a small memento, such as a keychain, prayer card, or stone, is stumbled upon in the purse, she is reminded to take a moment to say a prayer and take a deep breath before moving forwards. By incorporating small moments of prayer and mindfulness into the fabric of daily life, women will feel more balanced and capable of juggling her many roles. Because women are so often tending to others, they forget to take the time to take care of themselves. Many women feel guilty taking the time or money to go to the spa for a little pampering, but there’s no need for guilt. Your body is a gift from God, and by taking care of yourself, you are better able to serve your family and your faith. With a Night at the Spa theme, you can focus on little ways to take care of yourself, without spending too much time, energy, or money. Homemade facials, a fresh coat of nail polish, sugar scrubs and more can help a woman feel refreshed and relaxed. These little things can go a long way towards feeling happier and more energized in your faith. It’s virtually impossible now for many women to function without a smartphone. Calendars, schedules, lists, phone calls, and emails all live in one small device. It’s no wonder many women find it hard to shut off their phones, step back and enjoy the world around them. A Technology and the Modern Family Theme can help women regain control of the mental chaos these devices… and our crazy schedules, can create. Discussions about possible technology-free weekends and other means of reserving time for family and faith are sure to create engaging debate and self reflection. Consider discussion around Bible and devotional apps, and how it might be possible to have moments of faith at your fingertips each day! At Refreshing Mountain, we are very pro-family. We encourage women, and men alike, to make time for the things you cherish in life. A women’s retreat is an important time to remind women that they are essential. Too often, women go from one task to the next, without remembering to take care of themselves. Taking time each day for prayer and mindfulness, taking care of yourself, and finding ways to more seamlessly integrate faith into your life can help relieve stress and strengthen your faith. Refreshing Mountain has in-depth resources and tools to help you with planning your women’s retreat, so give us a call to start planning today!